This cool cruise isn’t difficult and features both paved road and paved trail for a great ride. Start at Salmon Cyclery on 2nd Street in The Dalles and head west (left). Turn right on Union Street. Cross beneath the Highway 84 overpass. The Riverfront Trail extends east and west from here. Turn right at River Road. Bear right on the trail near the intersection with Klindt Drive. Arrive at the east end of the trail near the SE corner of the Columbia Gorge Discovery Center parking lot. Reverse the route to return to Salmon Cyclery. 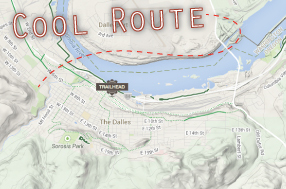 This route comes to us courtesy of Ride Oregon, Travel Oregon’s bicycle themed subsidiary website that’s jam-packed with great rides.